This recipe is the property of KarlitoJackson and released under the All The Flavors Public Domain license. You may not copy, derive or commercialize this recipe without following the terms of this license or the explicit permission of the creator. Smooth strawberry custard with Graham cracker. This really does taste like the original to me, i am loving it ! Oh yeah. This is the good stuff.. Snakes and sparklers. Been too long to judge the accuracy, but this is a phenomenal strawberry custard. It isn't overwhelming or in your face. It's layered, proportionate, and subtly complex. 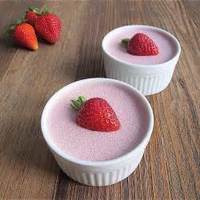 The strawberry blends right into the custard creating this decadent and sweet treat with a little textured graham note on the bottom. It's all working in sync, and even the numbers make me happy. An absolute joy to vape. ADV recipe here. I faved it. Have you?